IDrive Express™ speeds up your data transfers to the cloud account via physical shipment of temporary storage device. While transferring your files via the hard drives, Local Backup in IDrive encrypts your files using 256-bit AES encryption, with an optional private key. Moreover, along with file data, the file path is encrypted too. This means, even if the hard drive is lost or stolen, no one can ever access your files. Once you receive the USB hard drive, connect it to your computer using the USB cable and launch the IDrive application. From the 'Backup' tab, select the 'Backup files to my local / Wi-Fi device' radio button. Click and select the hard drive as 'Backup location on your local drive'. Go to the 'Restore' tab, choose 'Local Device' in 'Select files / folders for restore', and check if all your files have been backed up to the hard drive. Disconnect the hard drive using the 'safely remove hardware' button. Repackage the drive and the USB cord into the box they arrived in. Place the return label on the box, bring the package to the post office and ship it back to IDrive. We will upload the data to your IDrive account. Once your files are transferred to your IDrive account, you can continue with incremental backups using the conventional online backup process. You will not need to fill out the hard drive shipment form for additional devices. Download and install the IDrive application on each device. Connect the Express drive to your computer using the USB cable and launch the IDrive application. Click the 'Change' button and select files / folders for backup. 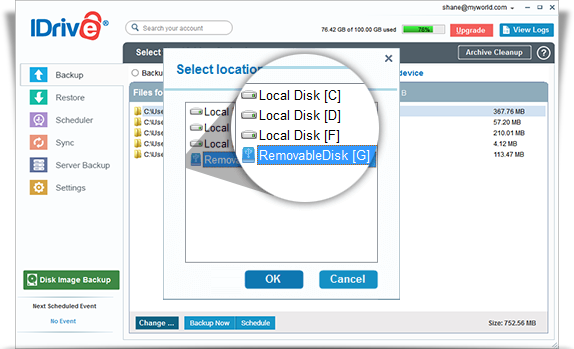 Click 'Disk Image' and select the hard drive as 'Backup location on your local drive'. Click 'Start Local Backup Immediately'. Let the IDrive application create a unique folder for each device. Repeat steps 1 through 7 for each additional device. If files are already present in your online backup account and those same files are also sent via IDrive Express, the backup files in your account will be maintained to avoid any conflicts. We recommend you to delete or purge existing data from your online backup account to upload duplicate files from Express device.